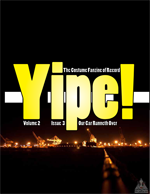 Yipe #3 is live! » YIPE! We present to you, in full color, a tale of how a solitary Doctor Who fan broke nearly thirty years of quietly loving the franchise and embraced a Doctor Who convention in full costume. It’s the issue where you’ll learn how a masquerade judge operates, and how you can make the most of your masquerade. You’ll see one of our own coming to grips with the fact she’s now, officially and inescapably, a costumer—or so her luggage tells her. Oh, and Mette wrote a madlib, too. One nit: The links to YIPE! Issue 3 in the sidebar do not work — the URLs are different from the ones in this posting. Thanks, John. I’ll fix them ASAP.